Holidays to Oia take you to perhaps the most iconic town on the beautiful island of Santorini. It’s located on the north west coast, giving you some of the best sunsets which can be seen from its position on the top of a volcanic crater. Whitewashed buildings creep up the hill, giving you fantastic views of the sea and the pretty town itself. There are even a few idyllic windmills and churches dotted around, ideal if you want to immerse yourself in iconic images of the island. If your idea of a holiday is spending days on golden sandy beaches, there are plenty of options within a 30-minute drive away. Choose from lively beach bars where you can listen to chilled music as it mingles with the sounds of the waves and order cocktails and refreshments straight to your lounger. Alternatively, there are little coves where you’ll find a secluded spot, or beaches offering watersports such as sailing and jet skiing. Oia is quite possibly one of the most photographed places in Greece, its landscapes are so beautiful that wealthy ship captains were known to call this little village home. If you want to marvel at the iconic Oia sunset, make your way to a good spot early, as the village does tend to fill up. 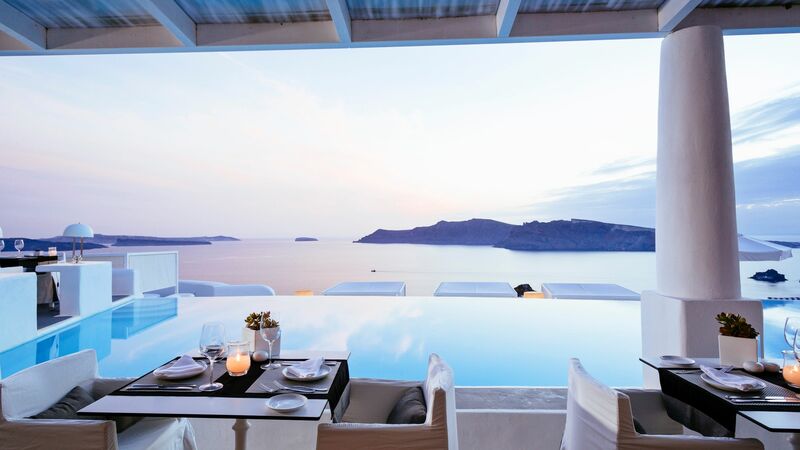 The restaurants at the caldera’s edge are firm favourites and have the best views. So, if you want to enjoy some traditional Greek cuisine as the sun goes down make sure you’re there a couple of hours in advance. During the day you may want to take a stroll down to Amoudi Bay, the descent is around 200 steps, but when you see the bay, you’ll know it’s worth the walk. The bay is home to Amoudi Harbour, so you can look forward to plenty of seafood in the tavernas, using only the freshest caught fish. The bay is steeped in picturesque red cliffs and boulders – a beautiful backdrop to your evening meal. Let Sovereign take care of all the hard work when you book your luxury Oia holiday with us. We’ll make sure every little detail is taken care of, with expert Trusted Advisers on hand to choose the right hotel for you. 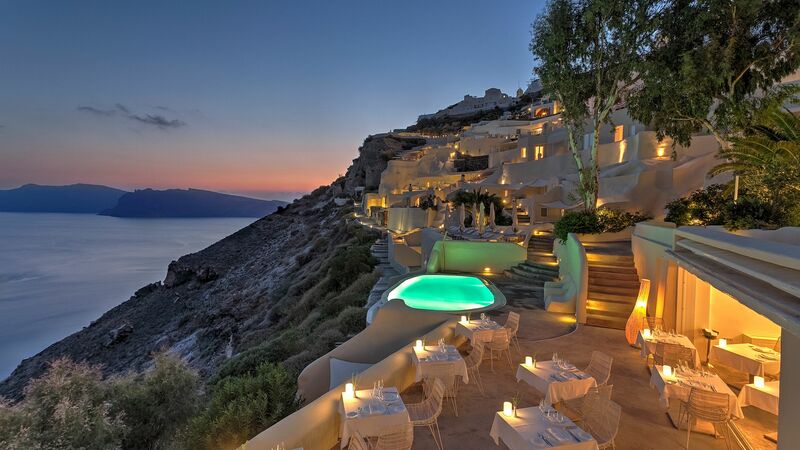 Stay at the Kirini Santorini for an infinity pool, and a luxury boutique experience with just 26 suites to choose from. Alternatively, Mystique, a Luxury Collection Hotel, has a relaxing, adults only boutique atmosphere, with incredible dining options including a secret wine cave. Oia has a gorgeous mix of shops, cafes and restaurants. Antonio's bookshop is well worth a visit for their eclectic mix of books, including one or two very special signed editions. Afterwards, a walk along to the castle to catch the sunset is a must. For dinner, I loved the family-run Meltini restaurant. According to my wonderful driver, they serve the best souvlaki on the island! Transfer time from Santorini airport to Oia is approximately 30 minutes.